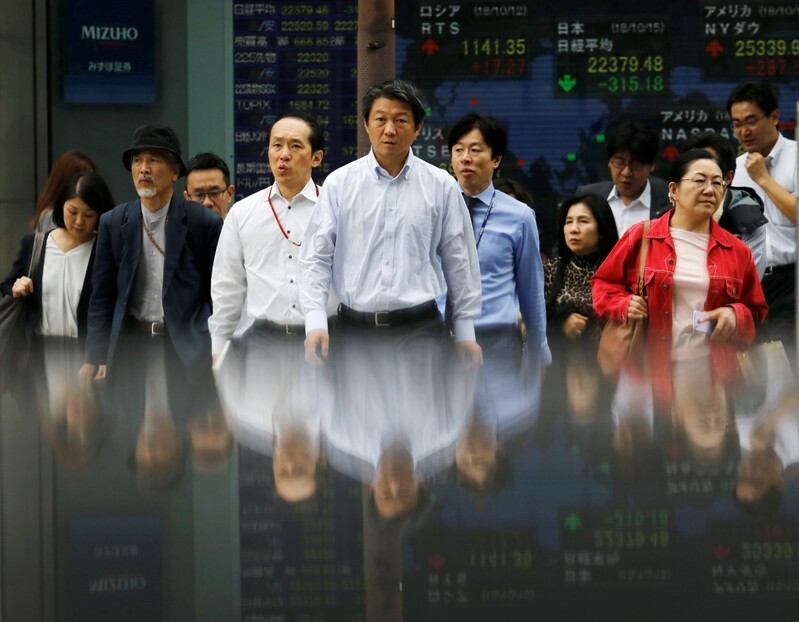 SYDNEY (Reuters) – Asian share markets fell anew on Monday as investors braced for the peak of the U.S. earnings season while angst over Saudi Arabia, Italy and Brexit kept geopolitics front and center. Adding to the air of nervousness was an early 0.4 percent drop in E-Mini futures for the S&P 500, while safe haven Treasuries caught a bid. MSCI’s broadest index of Asia-Pacific shares outside Japan eased 0.25 percent. 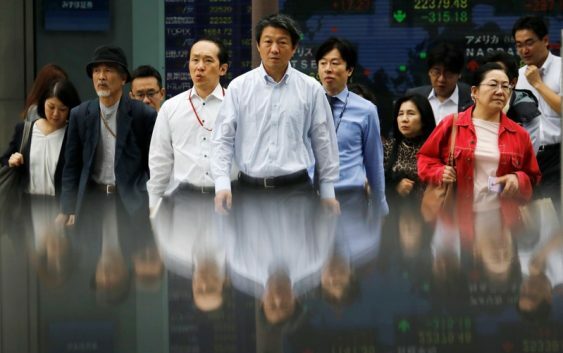 Japan’s Nikkei slipped 1.0 percent and South Korea stocks lost 0.7 percent. This week is the peak period of the U.S. earnings season and companies reporting include Amazon, Alphabet, Microsoft and Caterpillar. The outlook for global growth in 2019 has dimmed for the first time, according to Reuters polls of economists who cautioned that the U.S.-China trade war and tightening financial conditions would trigger the next downturn. Saudi Arabia remained in the spotlight as Riyadh on Sunday called the killing of journalist Jamal Khashoggi a “huge and grave mistake,” but sought to shield its powerful crown prince from the widening crisis. On Saturday, U.S. President Donald Trump joined European leaders in pushing Saudi Arabia for more answers after Riyadh acknowledged that the journalist died at the consulate following weeks of denial. In Europe, Italy has until Monday to explain to the Commission its breach of rules and faces the rejection of its budget, which may eventually lead to sanctions. Italian bond yields hit their highest level since early 2014 on Friday and the premium investors demand in comparison to German debt is at a five and a half year high. Italy is expected to be on the agenda when the European Central Bank meets on Thursday. The bank is considered certain to keep policy on hold and likely put off discussion about its reinvestment policy until December. The euro started the week steady at $1.1511 having bounced from support at $1.1431 on Friday. The dollar was a shade softer on the yen at 112.41 yen and little changed against a basket of currencies at 95.683. Sterling idled at $1.3065 as the market waited for more developments on Brexit. Prime Minister Theresa May will tell parliament on Monday that 95 percent of Britain’s divorce deal has now been settled but will repeat her opposition to the European Union’s proposal for the land border with Northern Ireland. in commodity markets, gold held steady at $1,227.40 an ounce. Oil prices edged up after suffering their second weekly decline on swelling U.S. inventories and concern that trade wars were curbing economic activity. Brent crude added 10 cents to $79.88 a barrel, while U.S. crude rose 13 cents to $69.25.